September 9, 2011 - Members of the North American Aerospace Defense Command and U.S. Northern Command came out in droves to attend a solemn remembrance ceremony in honor of those who perished in the Sept. 11, 2001, terrorist attacks. The ceremony, held at the NORAD and USNORTHCOM 9/11 Memorial, marks the 10th anniversary of the attacks that sparked a decade-long war in Afghanistan and was the catalyst for the creation of USNORTHCOM. Army Lt. Gen. Frank Grass, USNORTHCOM deputy commander, and Don Addy, National Homeland Defense Foundation president, laid a wreath at the memorial after speaking to the assembled NORAD and USNORTHCOM members. The September 11 attacks (also referred to as September 11, September 11th or 9/11) were a series of four coordinated suicide attacks upon the United States in New York City and Washington, D.C. on September 11, 2001. On that morning, 19 terrorists from the Islamist militant group al-Qaeda hijacked four passenger jets. The hijackers intentionally crashed two planes, American Airlines Flight 11 and United Airlines Flight 175, into the Twin Towers of the World Trade Center in New York City; both towers collapsed within two hours. Hijackers crashed American Airlines Flight 77 into the Pentagon in Arlington, Virginia. The fourth jet, United Airlines Flight 93, crashed into a field near Shanksville, Pennsylvania after passengers attempted to take control before it could reach the hijacker's intended target in Washington, D.C. Nearly 3,000 died in the attacks. Suspicion quickly fell on al-Qaeda, and in 2004, the group's leader Osama bin Laden, who had initially denied involvement, claimed responsibility for the attacks. Al-Qaeda and bin Laden cited U.S. support of Israel, the presence of U.S. troops in Saudi Arabia, and sanctions against Iraq as motives for the attacks. The United States responded to the attacks by launching the War on Terror, invading Afghanistan to depose the Taliban, who had harbored al-Qaeda members. Many countries strengthened their anti-terrorism legislation and expanded law enforcement powers. In May 2011, after years at large, bin Laden was found and killed. The destruction caused serious damage to the economy of Lower Manhattan. Cleanup of the World Trade Center site was completed in May 2002. The National September 11 Memorial & Museum is scheduled to open on September 11, 2011. Adjacent to the memorial the 1,776 feet (541 m) One World Trade Center is estimated for completion by 2013. The Pentagon was repaired within a year, and the Pentagon Memorial opened, adjacent to the building, in 2008. Ground was broken for the Flight 93 National Memorial in November 2009, and the memorial was formally dedicated on September 10, 2011. 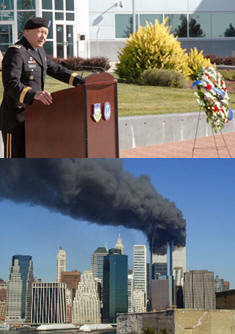 ?It?s been 10 years since the fateful day of 9/11 where nearly 3,000 people from 83 nations died on American soil,? said Grass. ?On that tragic day the terrorists said they were attacking the United States and our way of life. Obviously, they did not understand who we are or the values we hold dear. The cowardly actions of AQ and their supporters were meant to break our will. They thought it would cause us to wilt. Instead, it hardened our resolve and renewed our commitment to take the fight to the enemy." Grass said everyone has their own memories of 9/11, and that it was important to hold onto those memories. ?We can never allow those memories to fade with time,? he said. ?Today is a day to reaffirm our commitment and to rededicate ourselves to continue the fight and defend our homeland and our values. ?Today, we meet to honor the courage and bravery of our citizens who responded on that fateful day. We commemorate the many lives of our service men and women and those of our coalition partners who have been lost over the last ten years fighting extremism.? The USNORTHCOM deputy commander ended his remarks with a call to the audience to rededicate themselves to working to end violent extremism throughout the world. ?To win this fight, we must remain determined,? he said. ?We must remain vigilant. We must be resilient. And most of all, we must work to eliminate the hate around the world that breeds violent extremism.? Remembering Aviatrix Betty Skelton ?The First Lady Of Firsts?